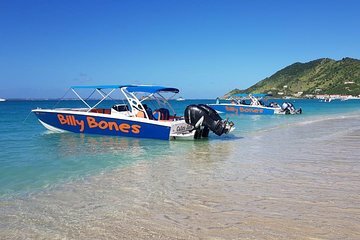 Explore the natural landscape of St. Maarten away from the crowds on a boat tour to a range of secluded locations. In addition to navigating, the boat crew ensure personal and comfortable experience by providing an open bar, snacks, and snorkeling gear. Stops on the itinerary include Tintamarre Island, snorkeling at Creole Rock, lunch at Grand Case, and views from Airport Beach. We had a wonderful time. AJ and Nicholas were our guides/captain. They were fantastic. Giving us info, providing music and drinks all day, even getting into the water with some hesitant swimmers/snorkel lets. The boat ride from location to location was fast and exciting! The stops were wonderful. We saw fish, turtles, and stingrays. We also had the chance to swim to prestige, white, private, secluded beaches. Lunch was good! Towards the end of our trip, we parked in front of Maho Beach and saw two planes come in very low for a landing. Well worth the money. We were gone from 9:30-4:30. Loved it. Water was a little murky from swells but the whole trip was beautiful and awesome!